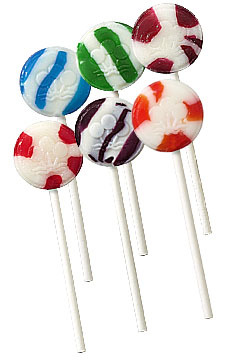 Gourmet sugar free Lollipops Six individually wrapped assorted flavors (Blue Berry Blast, Persian Lime, Raspberry Crush, Wild Strawberry, Concord grape, and Tangerine). They're so good you won't believe they're sugar free! I was very happy with my purchase, it came right away and was even gift wrapped wish was a very nice surprise. I will definately order from them again.